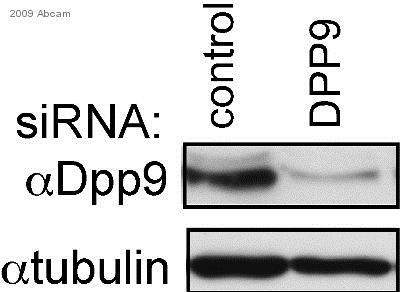 This antibody recognises all three forms of DPP9. This antibody does not recognise other DPP family members. Synthetic peptide corresponding to the catalytic domain of human DPP9. Our Abpromise guarantee covers the use of ab42080 in the following tested applications. WB 1/1000 - 1/5000. Predicted molecular weight: 98 kDa. Recommended dilution 1/1000 with colourimetric substrates, 1/5000 dilution with chemiluminescent substrates. Dilution optimised using Chromogenic detection. Dipeptidyl peptidase that cleaves off N-terminal dipeptides from proteins having a Pro or Ala residue at position 2. Ubiquitously expressed, with highest levels in liver, heart and muscle, and lowest levels in brain. Ab42080 staining Human normal placenta. Staining is localised to the membrane and cytoplasm. ab42080 staining DPP9 in bovine testicular tissue section by Immunohistochemistry (Formalin/PFA-fixed paraffin-embedded sections). Tissue underwent paraformaldehyde fixation before heat mediated antigen retrieval in Tris/EDTA buffer pH 9.0 and then the sample was blocked with 3% hydrogen peroxide in TBS for 10 minutes at 25°C. The sections were treated for 10 min with 3% H2O2 in TBS to block endogenous peroxidase activity and incubated subsequently for 30 min with 10% nonimmune goat serum to minimize nonspecific antibody binding. The primary antibody (1/50) was incubated with sample in TBS, 0.3% Triton X-100, 0.1 % BSA for 16 hours at 4°C. 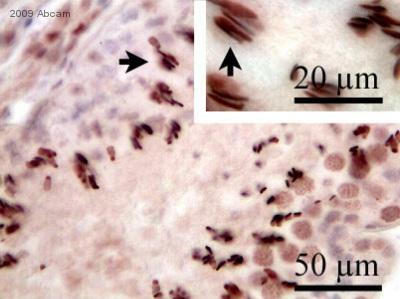 A Biotin conjugated goat polyclonal to rabbit IgG was used at dilution 1/200 as secondary antibody. ab42080 at 1/50 dilution staining DPP9 in rat brain tissue by immunohistochemistry (formalin/PFA-fixed paraffin-embedded sections). Sections were paraformaldehyde fixed, permeabilized in 0.2% saponin prior to blocking in 3% H2O2 in PBS for 10 minutes at RT. The sample was incubated with ab42080 for 1 hour. 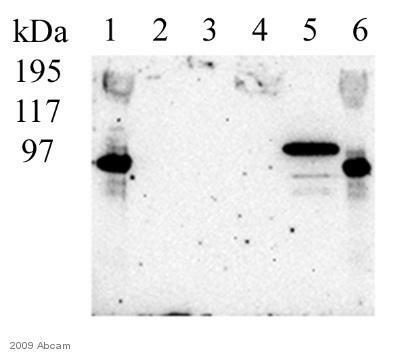 A HRP conjugated goat polyclonal to rabbit Ig, diluted 1/100, was used as the secondary antibody. ICC/IF image of ab42080 stained Hek293 cells. The cells were 100% methanol fixed (5 min) and then incubated in 1%BSA / 10% normal goat serum / 0.3M glycine in 0.1% PBS-Tween for 1h to permeabilise the cells and block non-specific protein-protein interactions. The cells were then incubated with the antibody (ab42080, 1µg/ml) overnight at +4°C. The secondary antibody (green) was Alexa Fluor® 488 goat anti-rabbit IgG (H+L) used at a 1/1000 dilution for 1h. Alexa Fluor® 594 WGA was used to label plasma membranes (red) at a 1/200 dilution for 1h. DAPI was used to stain the cell nuclei (blue) at a concentration of 1.43µM. Publishing research using ab42080? Please let us know so that we can cite the reference in this datasheet.